We are excited to present this personal travel story from one of our top ten Travel Writer Award finalists. Read more about the travel experiences of Kevin Torrin. As our bus pulled over at the parking lot, a certain dread could be felt in the air as if the cries of the thousands of souls who perished in this god forsaken facility still echoed in the air. The lively restaurant at the entrance contrasted heavily with the quiet and eerie grounds of the facility. Crows perched on the barren trees quietly observed the groups of visitors increasing the sense of dread already present in our hearts. After a brief security check, we proceeded quietly to the main gate, retaking the same path as those condemned to a living hell over half a century ago. A black wrought iron arch marked the entrance of the camp. On the arch could be read the words “Arbeit Macht Frei”, or “Work sets you free” in German, written in black metal letters. The simple brick facades of the buildings and the cozy interiors betrayed their horrendous purpose. As I walked on the rugged cobblestone paths, the clouds huddled in the sky as if mourning the passing of the camp’s many victims. The cold polish air penetrated my thick outer clothing and froze my fingers. I could only think of those who were forced to work naked, scared and exposed to this freezing weather with only a meagre daily ration to keep them alive. My class and I followed our guide down one of the buildings corridors. 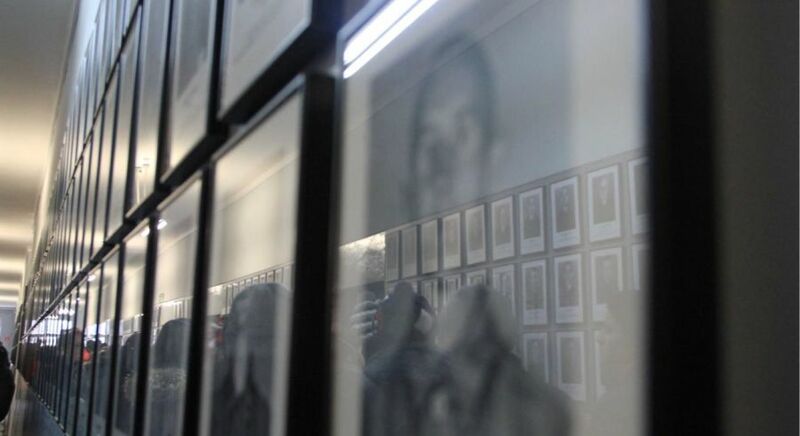 On both walls were hung black and white mugshots of the many people who perished in this camp. Two dates were written on their pictures: the date of entry and the date of death. Seeing all the faces of those who perished added an emotional and human heft to the genocide that couldn’t be conveyed through the numbers and statistics we so often hear and learn in our history classes. 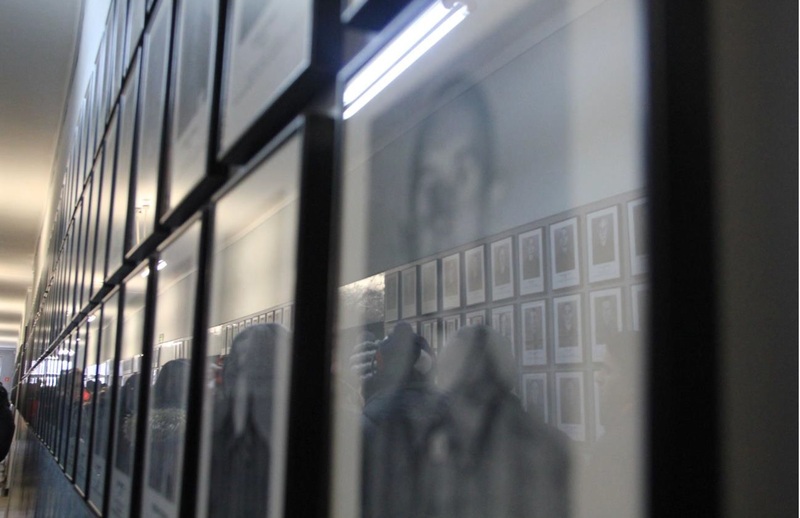 We then proceeded to climb up a steep flight of stairs as the curators of the site prepared an exposition on the second floor to vividly portray the horrors that occurred in this very camp. Behind a large panel of glass could be seen a mound of hair. This exhibit showed how the prisoners were shaved before being herded into cramped rooms like sheep, like animals. The hair was then weaved into new uniforms that were then worn proudly by their captors. Already feeling very uneasy, I moved on to the next exhibit. Behind the glass panel lay the many confiscated belongings of the newly arrived captives. Bags, prosthetics, pans, apparel, jewelry and most heartbreaking of all, toys. The sight of the colorful toys and other belongings still freshly imprinted into my mind, I moved on to the next exhibit. All I could see were ordinary cans piled one on top of the other. However, they were not ordinary cans. On the label could be read the words “Zyklon B”, a pesticide used to kill the detainees as if they were some sort of unwanted vermin. My gaze fixated on the cans, I couldn’t help but imagine the extent of mankind’s sadistic ingenuity. 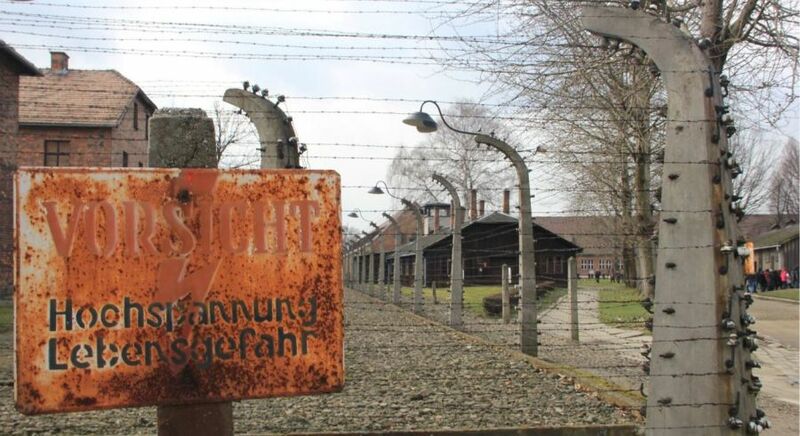 This was only the start of my journey however, as we hadn’t yet visited the sites where the prisoners were executed. We entered an empty courtyard flanked by two double storied brick buildings. 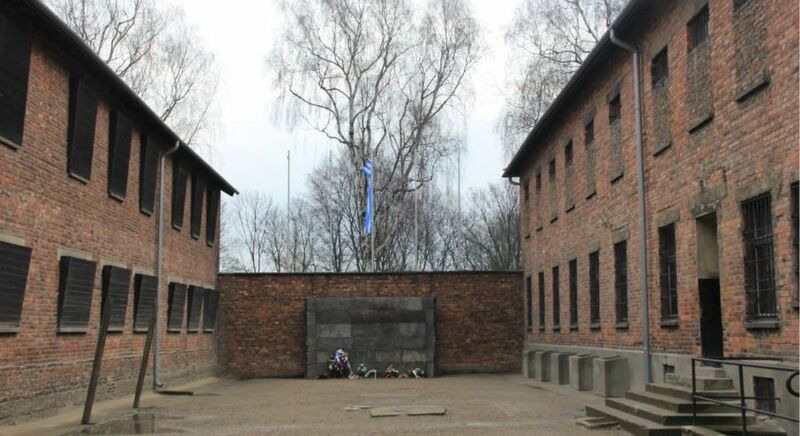 A wall made of concrete blocks stood menacingly at the end of the courtyard. The austere demeanor of the wall conflicted with the colorful flowers and candles adorned along its base, a late tribute to those who lost their lives pressed against its cold hard surface. A scene I could only describe as the meeting between life and death. We entered the building’s basement flanking the courtyard whose purpose was to detain those condemned to be executed. Massive wooden doors guarded the entrances to cramped and humid cells with a pitiful excuse for a window located in the uppermost section of the back wall. I shrug to the thought of being a lone inmate and having to hear my fellow inmates plead for their lives as they are dragged to the wall, their vain cries for mercy answered only by the deafening roar of multiple firearms. A lone inmate shoved into a brick box. A lone inmate, awaiting his time, counting the days until his last breath is drawn. The guides reserved the worst for last however. 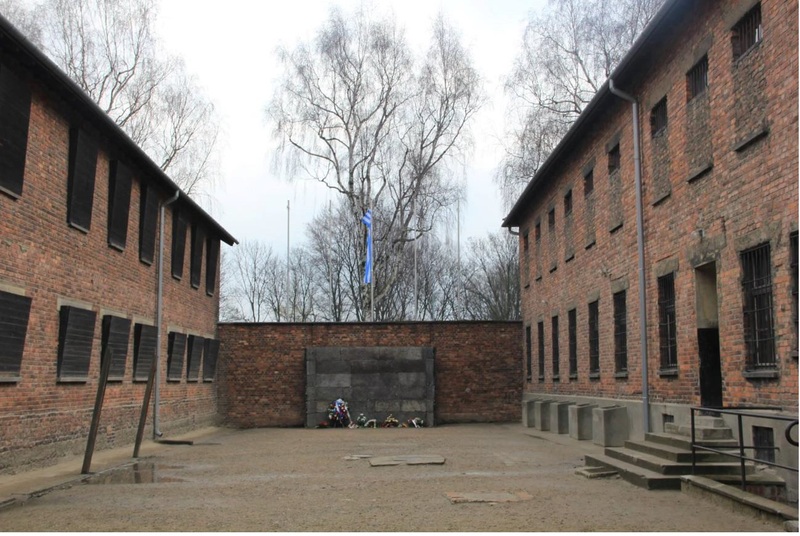 We were about to visit the gas chambers and the crematoriums. We approached a plain rectangular concrete building with a sole brick chimney jutting out of it. The building consisted of one rectangular room with a pipe lining the ceiling on the right. I felt very uneasy standing in the same room where thousands of men, women and children perished on the basis of a racist and anti-Semitic ideology, on the basis of one man’s ambitions. A door to the left of the room led directly to the crematorium where the bodies of the deceased were turned to ash, making it as if they totally vanished from this earth. 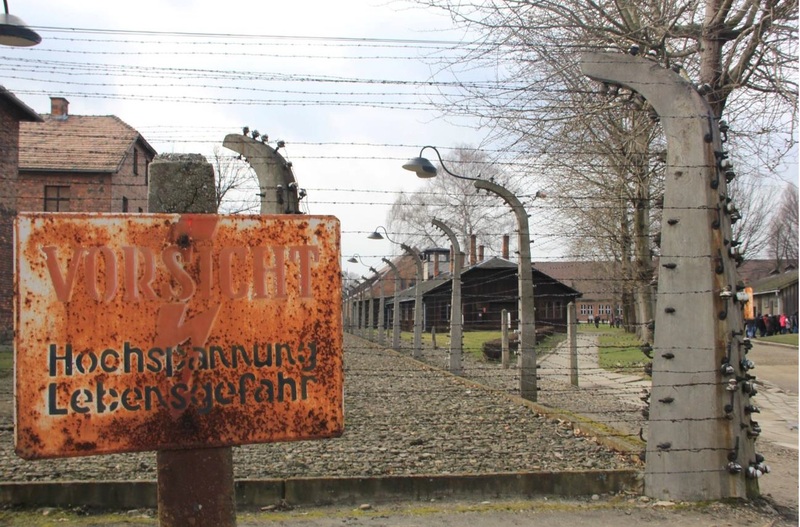 This visit of Auschwitz inspired me to rethink my relations with other people especially of different ethnicity and religious backgrounds. In this day and age, we have never been as exposed to other cultures and religions and we should learn to embrace each other’s differences to avoid repeating the horrors of the past. Did you enjoy reading about Kevins’s travel experiences? 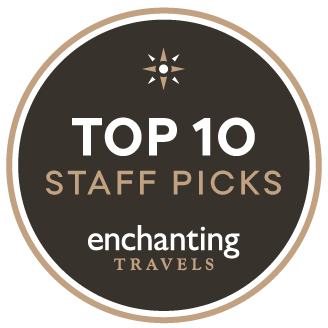 Like his story on Facebook to vote for Kevin and he could be the winner of our Travel Writer Award 2017!